Ruthie Cooney is a native Virginian who recently made her way back to the D.C. area after a thirteen-year stint in Texas and Colorado, during which she accidentally graduated from the Colorado School of Mines with a B.S. in Geological Engineering. 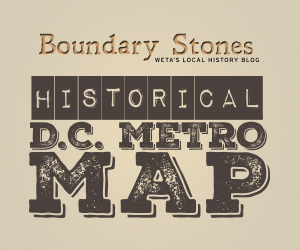 Armed with a passion for storytelling, Ruthie was delighted to find Boundary Stones and learn of WETA’s commitment to reviving the history of Washington, Virginia, and Maryland. She cites her deep affection for Remember the Titans as the source of her interest in local history! The atmosphere at the Hay-Adams Hotel remains one of hospitality and timelessness, just ask the woman who’s supposedly made it her home for over 130 years. Tarnishing its long held reputation of extravagance and exclusivity is the hotel’s only unwanted guest: the esteemed ghost of the Hay-Adams, Marion Hooper Adams. Her brilliance as an intellect and socialite in the late 19th-century are made all the more legendary by her tragic and early death.